The InVitria® simplifies intravitreal injections by making the procedure faster and more predictable. Its unique design presents a guide tube accurately oriented to ensure a fixed injection angle of 28°, a fixed distance at 3.5 mm from the limbus, and a fixed 5.60 mm depth. The InVitria® ensures a safer injection procedure that eliminates the need of speculum, caliper or pressure plate. 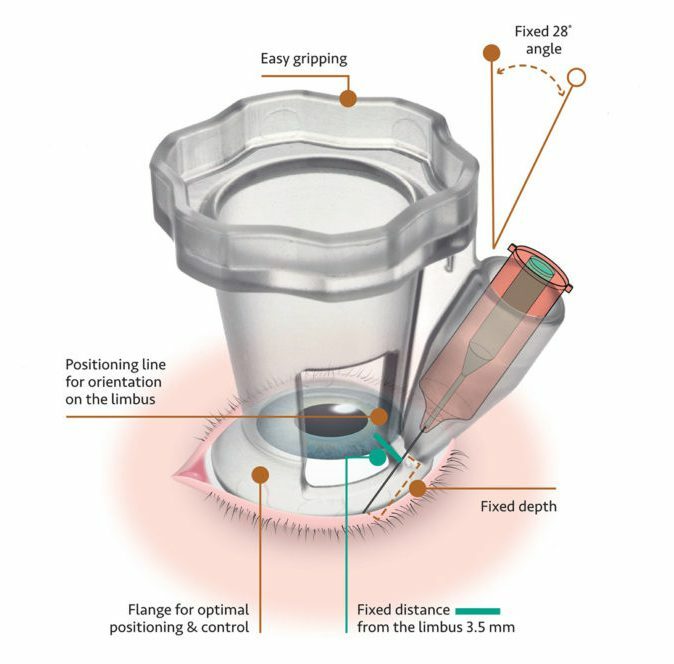 After preparing the patient for the procedure, the InVitria® is carefully placed on the patient's eye with the positioning line on the limbus. By gently pushing down and rotating the InVitria® device, the eye is stabilized so the patient feels an anesthetic effect due to the pressure, and cannot see the needle coming. After removing the needle, a rotation post-injection replaces the conjunctiva and seals the injection hole.